This is the first time I make a Charaben for dinner. 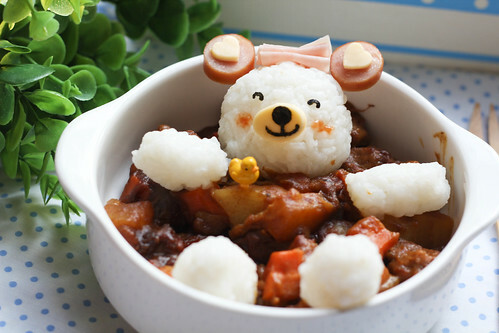 I saw this bathing bear bento sometime back on a jap blog, had wanted to try out but din have the opportunity. Daddy's not home for dinner today, and that is the time when I will cook a one dish meal for dinner. It's also usually a beef dish, that is coz Daddy does not fancy beef, so I hardly cook it when he's around. 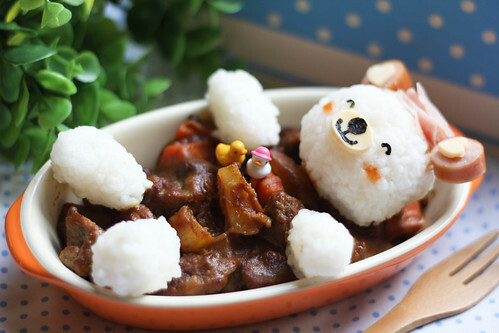 So, here's presenting our no fuss dinner for tonight, Japanese beef curry with potatoes and carrots. And here's LT's bear taking a soak.